* Bench type pH meter. 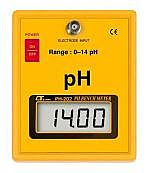 * Accuracy : 0.1 pH (pH 4 to pH 10). * Application : Education, School, Laboratory, Industrial & Quality control.